It is an interesting phenomenon to note that the Baby Boom generation, which is considered to be persons born between1946 and 1964, has according to many reliable reports significantly more health issues when compared with the previous generation. Every morning in South Carolina and across the nation an army of people get up and get ready for work with no expectation of being paid for their efforts. What could possibly motivate a person to share their time and talents solely for the benefit of others? Most businesses want your frequent return business. Hospitals, however, do not, at least not within 30 days of your discharge. So, Hospitals across the country and here in South Carolina are scrambling to find ways to decrease readmission rates. A person’s overall health and wellness is a complex concept that includes many disciplines within the healthcare industry. Agapé Health and Wellness is concerned about the health of its residents and patients as well as its employee’s and is constantly seeking ways to improve the delivery of care through both advances in technology and by providing the most up-to-date education for its caregivers. Because of the company’s integrated approach to healthcare services, a team of experts exists within the interdisciplinary fields required for that delivery. One of the goals of Agapé and a goal of this site is to make our expertise easily available to the public in order to help them make informed decisions about their healthcare needs or the needs of a loved one. Agape Health and Wellness cares for thousands of residents and patients across South Carolina each year and that experience translates into knowledge that cannot be obtained through an internet directory site or a lead generation site that has no direct connection with providing care. We believe the more you know about your healthcare options the better prepared you will be to make smart choices. Many people wait until there is a crisis where critical decisions have to be made quickly without having good information to base those decisions on. Our Physicians, Clinical Nurses, Physical Therapists, Social Workers, Chaplains, Senior Solution Advisors along with a vast array of other experts in the healthcare industry are committed to providing information and answers for the tough questions that matter most to consumers. AskAgape.com is your Health and Wellness Resource Center, and is available online 24/7 to help you find the answers you seek. Our vision at Agapé Senior, Agapé Hospice, Inc., and Agapé Healthcare and Wellness is to help serve our people in South Carolina with an integrated health services network, and a primary care presence in strategic markets throughout our beautiful state. 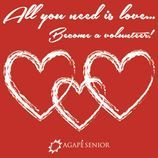 Agapé Senior is recognized as a senior services provider of distinction, which values its employees and functions with a financially responsible plan and an empowering environment.